The XTERRA Fitness TR150 Treadmill combines the quality and performance you desire with the flexibility of a machine that can be easily folded up and stored away. Specifically designed for the home environment, the TR150 incorporates numerous thoughtful features that were developed with your performance and comfort in mind. The console was designed for ease of use while still providing you with all the features you deserve. A large 5” LCD provides you with important workout feedback while the intuitive button layout incorporates Quick Touch speed buttons for quick access of your favorite speeds – great for interval training! The integrated bookrack and accessory holders keep your reading material, remote control, and anything else you want close by, right where you need it. And to help keep you in your training zone, hand grip pulse sensors are conveniently mounted on the side handlebars. The heart pounding speed range up to 10 mph is powered by a smooth and quiet 2.25 HP motor. 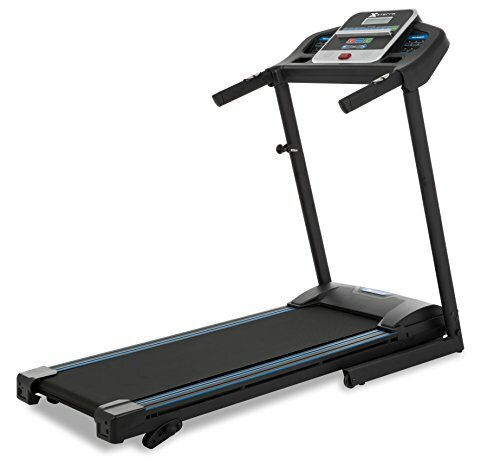 The 12 preset programs offer unmatched variety while the XTRASoft Cushioned Deck technology, large 16” x 50” running surface, and 3 manual incline settings allow you to push your limits. Start on the road to fitness today with the XTERRA TR150 Treadmill and exceed your expectations.